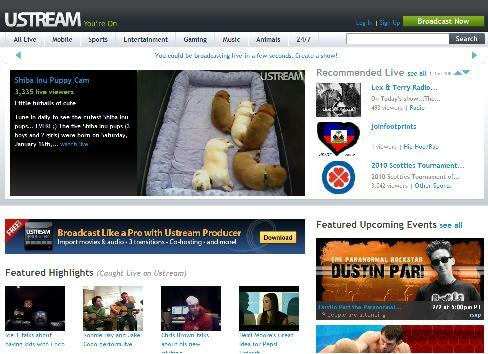 Ustream - The Next YouTube? Ustream (ustream.tv) is making a push to become the Web's live broadcast leader, and perhaps the next online video revolution. Recently they released Ustream Producer; a desktop app that helps users create more professional live broadcasts. Now, instead of a simple one-dimensional live webcast, users can import audio and video media to include in the broadcast, incorporate picture in picture co-hosting, pop-out chat rooms, screencast within the broadcast, syndicate to Twitter, Facebook, MySpace and AIM, and produce higher quality streams; all for free. A paid version for a one-time fee of $199 allows for even more customization. YouTube proved that consumers are willing and actively watching online video, and live webcasting might just be the next big thing. For businesses, a live broadcast can bring consumers closer to a brand, in real-time. Look no further than Steve Jobs and Apple to see the enormous impact a live product announcement can have. Businesses can build buzz through all networks they use to announce a "live product unveiling," then easily use Ustream to execute the task. A live broadcast has much more "flair" than simply embedding, tweeting or e-mailing a pre-recorded video. It also carries a different attitude. A live broadcast has a user-friendly feel and less a marketing tilt that can accompany pre-recorded video. Media websites can take advantage of Ustream to air live interviews and updates from events they are attending, or to cover local events as they unfold. This holds the advantage of being "first" in any crowded industry. Live webinars can help a business educate their consumers when time is of the essence. Ustream recently announced a series of new funding that has the potential to raise $75 million, or even more. One of the main uses of this funding will be to expand services in Asia - an enormous audience that will no doubt catapult the site past its current mark of 50 million live video viewers in January. What's more, Ustream has an iPhone app for video streaming - another important touch point for savvy audiences made even more important with the release of the media-friendly iPad. Ustream apps have been downloaded more than 1.5 million times. Should you decide to broadcast live using Ustream, remember that it's just that - live. You won't be able to edit or make adjustments. Consider a detailed plan before broadcasting and make a few non-live trial runs first. Just like any video, you have a limited time to capture users' attention and make a good impression. Visit Ustream to learn more about Ustream Producer.